Ada Brooks is rocking along with school. Her biggest struggle is P.E., and my biggest struggle is how much to require of her and how much to let go. But, we're figuring that out - with the help of some wise counsel and the help of her teachers. Her favorite activity is visiting the library, but, my bright daughter cannot seem to grasp that if she reads the entire hour we are there, she will have picked no books to bring home. She'll get frustrated if i tell her to put a book down, and i want to look at her, and in a not so gentle voice, say, "you can take it home, dumbo" I refrain from going quite that far, but i fear i probably get too close. Eason will be THREE in three weeks. I am shocked by this, but you know, that's how it happens. They just keep growing up. He's requested a yellow birthday party. For a while, he wanted a lemon cake, but i'm almost positive that's because his sister convinced him that to have a yellow cake, he must have a lemon cake. He's been cured of that misconception (thanks to an intervention by his godmother and me), and now he'd like "a strawberry cake, but maybe one with all the fruits" The kid does love fruit - all of the fruits, save lemon, so i think he's right on target with that request. But, i think strawberry is more practical. But, Eason's godmother, a baker by trade, has had two cake baking opportunities. One was amazingly fabulous, and as she and I discussed recently, the other could have been better. It was good - just not up to mary ellen quality. But it was cute.... and it wasn't her fault that two year old eason declared he wanted a "chocolate milk cake"
For his first birthday, I imposed one of my favorite things, and we had a frog party. But this year, Mellen is not constrained by anything other than yellow. 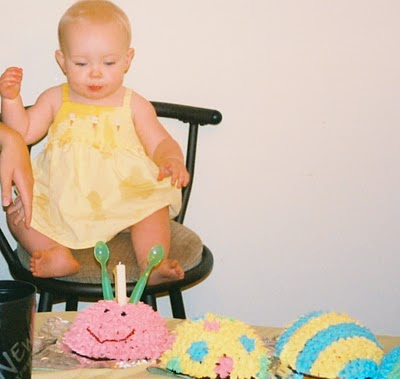 So, it should be a, in the words of the almost birthday boy, "a super yummy fruit cake with strawberry spots"
Will baby Collins (who is rocking along with the sweetest disposition and being easy as pie) even have a first birthday party? His godmother, who recently rescued his fingernails from becoming a guiness record length, will probably make sure he does. "Third babies just get neglected on things like fingernails" she said. Hopefully not on the things that matter most, though. Speaking of things that matter most, i've lately been debating about required reading for ada brooks. I'd love ideas - favorite books - from, specifically, early elementary school. She's not quite ready for Little Women, which i've been waiting for her to read since the sonogram lady said, "girl." But stuff a little lower level than that - She just finished Pippy Longstocking and loved it. It's lent around here (did you know? ), so i'm only 'recreationally interneting' on Sundays (which seems a bit backwards, i can see, but i've got my reasons). We're also only consuming adult beverages on sundays. I've just realized this could be a deadly combination. Ada Brooks, who gave up mustard for lent last year, declared herself too young for a meaningful lent. I thought this better than refraining from mustard. Lent is such an important season for us - something we, although we are not episcopalians these days, could never give up. Godparents (who would make the cakes? ), real wine communion, and Lent. Or more generally, the church calendar. We operate in seasons, and it is important for those seasons, like all of life, to point us toward Christ. And when these seasons of the church do that, then they are helping us glorify God. Just another tool in our too box. (And when, unfortunately, they do something quite the opposite of help, they are perhaps doing more than just failing to glorify God, they are mocking Christ's Church). So yes, we 'do lent' - and no, we aren't the most fun people in the world during this six and a half week time of the winter (reflection on sin- fun anyone?) - but, boy howdy, come Easter, you should come to our house. We are waiting, often not so patiently, to shout "the Lord is Risen indeed." So, I hate for Eas that he was born during Lent. I think his birthday will always be during this season of fasting. But, we'll just continue to have his parties on Lord's Day afternoons. So we can have cake and cold beer and burgers on the grill. Sundays during Lent have been described as mini-easters, and on Eas's birthdays, we have mini-eason-easters. and how could I forget the american girl books?